Parklets are coveted features, but they often create controversy. Some argue that there are too many parklets in the Mission. Still, the businesses that plan them are convinced that they’re cool. The controversy lies in parklets prioritizing pedestrians over cars on streets already notorious for difficult parking. Not to mention their tendency to attract taggers, trash and vagrants. 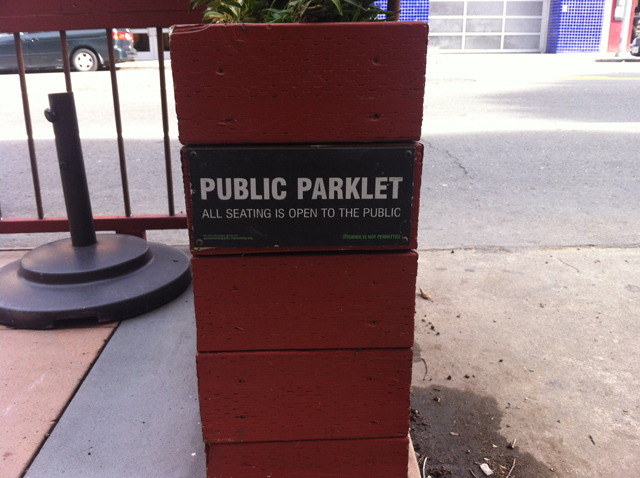 Ritual’s parklet has had its share of trouble. The coffee shop started the process of creating its parklet back in 2010, but faced opposition mainly because it would take away two parking spots. For Ted Gon, a contractor building Ritual Coffee Roasters’ parklet on Valencia and 22nd, it is difficult to explain to people from out of town what a parklet is in the first place. He tells me that several people have stopped and asked him what the half-complete wooden structure is. “I tell them it’s some outdoor seating with chairs and that it takes some parking spots,” says Gon, who thinks parklets are more interesting than regular outdoor seating because they create a nicer environment for pedestrians. The parklet at Ritual was designed by Boor Bridges Architecture, the same firm that built Fourbarrel Cofee’s parklet on Valencia and 15th streets. That parklet has raised benches, a bike rack with a 27-bike capacity, and stools . Just a block away from Ritual, the Crepe House also has a parklet. And not far from there, Arizmendi Bakery has been fundraising to cover the costs of their own parklet. To get a parklet, the business must submit a design for approval by the Department of Public Works and, if no neighbors object, the building may begin. It turns out that the city had approved Arizmendi’s design, but then rescinded its approval because the proposed width was 8 feet. Arizmendi is now working with their designer Nathan John to submit it again, this time with a width of six feet. “We are a few months behind, but we are hoping for May,” said Sam, a baker who is part of the team in charge of the parklet endeavor who did not want to give his last name. To see where these new parklets will fit in with existing ones, check out this map of parklets in the city. This has been your Afternoon Report, in which we offer a quickie post-meridian rundown of some minor developments in the always-happening streets of the Mission District. Got ideas or suggestions? Let us know what you think by sending an email to info@missionlocal.com. Correction: An earlier version of this article stated that Sam, the baker from Arizmendi was in charge of the parklet endeavor. Sam is part of a team in charge of the parklet. We regret the error.